Domperidone is a type of medicine called a dopamine antagonist, an anti-sickness medicine. The active ingredient domperidone speeds up the passage of food through the stomach into the intestine, which physically helps prevent vomiting and reduces nausea. Domperidone also prevents messages from being sent to the vomiting centre in the brain. This also helps reduce nausea and vomiting. Domperidone takes effect within 30 to 60 minutes and provides six to eight hours of relief. Domperidone is a prescription-only medicine. Dopamine antagonists are used to treat sickness (nausea) and vomiting due to many causes, including intestinal problems, migraine (severe headache), motion sickness or medical treatments such as chemotherapy and anaesthesia. Domperidone stops feelings of sickness and vomiting, whatever the cause may be. 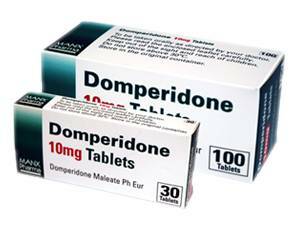 Domperidone tablets should be swallowed whole with some liquid, preferably before meals. If used for migraine, take a Domperidone tablet and a painkiller as soon as you feel a migraine attack coming on. For more information, see the package leaflet. Adults and children aged 12 and above: one to two tablets, three to four times a day. Do not take more than eight tablets in any 24-hour period (4 x 2 tablets). Domperidone is not suitable for children weighing less than 35 kilos. Always follow the prescribed dosage and read the package leaflet closely before use. Hormonal disorders (e.g. enlarged breasts in men) or menstrual disorders. Consult a doctor if the side effects are bothersome. For a complete list of side effects, see the package leaflet. You suffer from severe abdominal cramps or pass black stools. Consult a doctor on the use of Domperidone if you have a health condition that is not listed above or are currently on medication. Domperidone may interact with other medicines. The doctor will have a list of medicines that you should avoid mixing it with. Domperidone should not be used by pregnant or breastfeeding women without consulting a doctor first. This medicine does not interact with alcohol or affect your ability to drive safely.